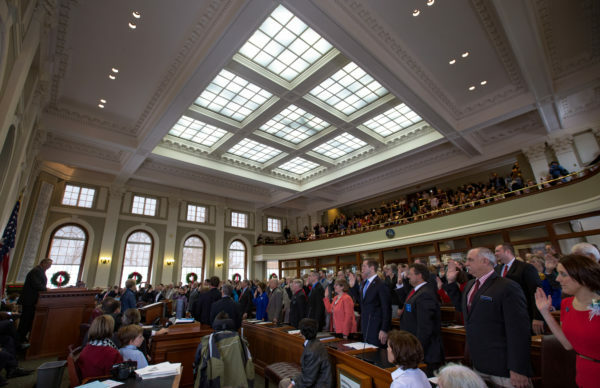 Members of the Maine House of Representatives are sworn in for the first session of the 128th Legislature in December. AUGUSTA, Maine — A bill that would prohibit lying during legislative hearings failed Wednesday in a narrowly divided vote in the Maine House of Representatives. The bill, proposed by Republican Rep. Heather Sirocki of Scarborough, would have applied to lobbyists, executive branch officials, state employees and members of the public, but not sitting legislators. Anyone who purposely provided false testimony to a legislative committee under the bill’s provisions would be guilty of a Class E crime if they were not put under oath by a committee chair or a Class D crime if they were. Lobbyists found guilty of the proposed law could have been suspended from lobbying for up to two years but they need not worry about it following Wednesday’s 72-71 vote. All House Democrats plus Republican Rep. Lance Harvell of Farmington voted in favor of a motion to kill the bill while all the Republicans plus Democratic Reps. Craig Hickman of Winthrop and Denise Harlow of Portland, voted to advance it. Three independent House members split 2-1. The bill’s supporters argued that it would elevate truth in legislative discourse while opponents said it would be too much of a burden to enforce. The Roman Catholic Diocese of Portland said during committee testimony earlier this year that the Eighth Commandment that Moses received from God has lying covered, but Suzanne Lafreniere of the diocese supported the bill anyway. “The Catholic faith requires honesty,” she said. On the same day, Secretary of State Matt Dunlap disagreed. Not with the notion that lying is bad, but on the idea that the bill should be passed. He told a story about testimony he once gave as a legislator against repealing hunting safety measures. There were no incidents during the next fall hunting season, leading Dunlap to question whether he had provided false testimony as defined in Sirocki’s law. During House debate Wednesday, Sirocki said 41 other states have some version of her proposal on their law books. Rep. Roland Martin, D-Sinclair, suggested Wednesday that some constituents could unknowingly say something that’s not true and face criminal consequences. Harvell quipped, sarcastically, that he’s been having nightmares about the bill and a dreamed-up day at the State House when he struggled not to provide false testimony. Harvell’s story involved truth serum and “faceless fact checkers … looking to put me in handcuffs.” Harvell intimated that he attracted his wife to Maine, a state which he described as “halfway to the North Pole,” with some semi-truths. The bill faces additional votes in the House and Senate but its chances of enactment are slim at this point.